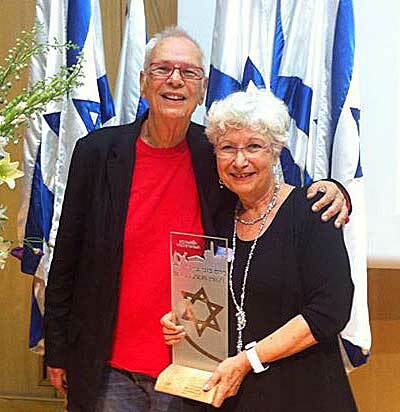 The Dry Bones comic strip creator, Yaakov Kirschen, was awarded at the Knesset yesterday the Nefesh B’Nefesh Bonei Zion (“Zion’s builders”) Prize, which recognizes the achievements of outstanding Israeli immigrants from English-speaking countries and their contribution to the State of Israel. Kirschen and his “Long Suffering Wife,” Sali Ariel, at the Knesset, after the award ceremony. (Jerusalem) As the Jewish holiday of Shavuot approaches this weekend, Nefesh B’Nefesh, which works in close cooperation with the Ministry of Immigrant Absorption and the Jewish Agency for Israel, organized a special celebration yesterday in Ein Yael, Jerusalem for new Olim to better prepare them for their first Shavuot in Israel. At the event, the children, accompanied by their parents and Nefesh B’Nefesh staff, prepared for Shavuot by assembling delicious baskets of fruit, which is a customary tradition in Israel during this period. Photo Credit: Jared Bernstein Photography courtesy of Nefesh B’Nefesh.